If you are a keen walker looking to up your fitness levels, Nordic walking could be just the thing to turbo charge your next outdoor ramble. Walkers use specially designed poles which help to engage the upper and lower body, meaning that 90 per cent of the major muscles are being used with every step. So what equipment is needed? All Nordic Walking UK instructors will offer a 45-minute taster session for free. Simply put your postcode into the Find a Class section on www.nordicwalking.co.uk. 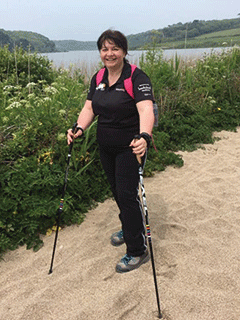 Viki Carpenter, 43, from Cornwall, is a keen Nordic walker. Here she explains how she got started and what benefits she has gained from it. “A friend recommended Nordic walking to me a couple of years ago. When I went to try it, I was a bit cynical to be honest. I didn’t really think poles were necessary and thought I would look foolish using them. It seemed an ‘older person’ activity. But the instructor, Kelly Bennett of Walk Kernow, was really helpful. She explained that Nordic walking was a means of exercising the upper body as well as your lower body while walking, almost a mobile cross-training if you will. “We were taught the basics of the technique, how to hold the poles properly so you don’t slip and hurt your wrist, how to use the poles to help you go up hills and down hills. This was a revelation as it is so much easier to go up hills whilst Nordic walking as you can use the poles to take the strain off your leg muscles. It’s also the case that you burn as many calories per mile as you do running, but there is less strain on your joints. It’s a very sociable exercise and I have made a lot of friends walking with my group Walk Kernow – it’s very natural to talk as you walk and drop in and out of conversation with different people. It’s also a lovely way to go out and enjoy being in the countryside. I see all the seasons now, frost in the woods in the winter, the first signs of spring and all the changing hedgerow flowers that come out over the summer and autumn. I also enjoy the benefits of extra vitamin D as well as the sense of wellbeing that being out in the great outdoors brings. Whether you’re a Nordic walker or an ordinary hiker, the Ramblers Festival of Winter Walks is a great way of getting outside and enjoying the British countryside at its wintry best. This winter walking festival takes place between 17 December 2016 and 8 January 2017 and has plenty of free activities on offer. Ramblers groups will be leading hundreds of free walks taking place all over Britain. These range from short festive strolls to blow away the cobwebs, right up to whole day hikes to kick-start New Year’s resolutions, and everything in between. In England people can join Walking for Health, England’s largest network of health walk schemes, delivered in partnership by the Ramblers and Macmillan Cancer Support. In Wales they can walk with Let’s Walk Cymru, led by Ramblers Cymru. For those who prefer to walk alone, or lead their own walks, festival routes are available from Ramblers Routes, an online library of more than 2,500 of Britain’s best walks. Anyone in Scotland can download the free Medal Routes App to find over 1,100 short walks across Scotland.